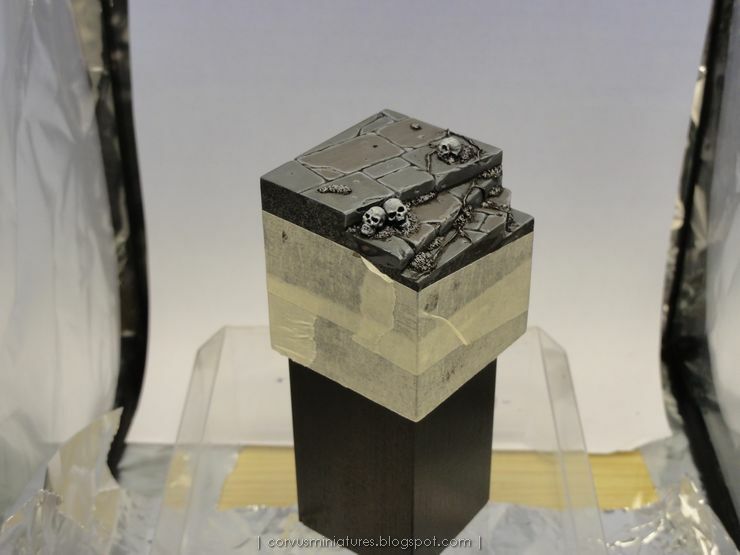 EDIT: the plinths mentioned in this article are no longer manufactured by VoodooWorx but are now sold by Secret Weapon Miniatures. 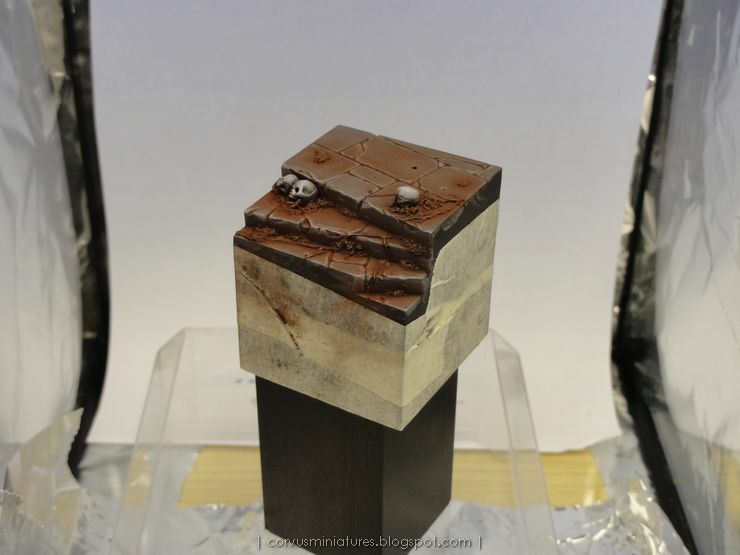 In this tutorial I will explain in detail how the base of my latest finished miniature, Bregan, Apostle of Darkness, was made. It's actually the first real step-by-step tutorial I have done for this blog. It was time-consuming but fun to do, so I might think about making another one soon. If you have any ideas for a particular tutorial you want to see here, please write it down in the comments section at the bottom of this post. The plinth itself is from VoodooWorx (you can buy the item here), but as you will see some extra details were added. 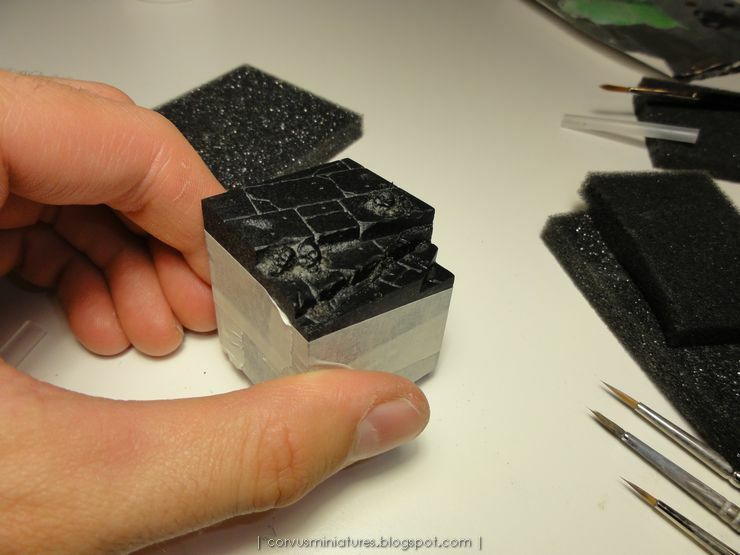 One important thing to notice before you start working with a resin plinth (just like any resin, plastic or metal part) is to wash it thoroughly (preferably in lukewarm water with dish-washing soap and a toothbrush). First thing to do is drill a hole in the base to be able to pin the model on to it when everything is done. I positioned the unpainted figure on the base first to get a good idea where his foot which was going to be pinned would be. When the hole and pin were in place I also did a dry fit to check one last time. The plinth already looks great, but I wanted to add some extra details, so I went to check my basing materials for something. 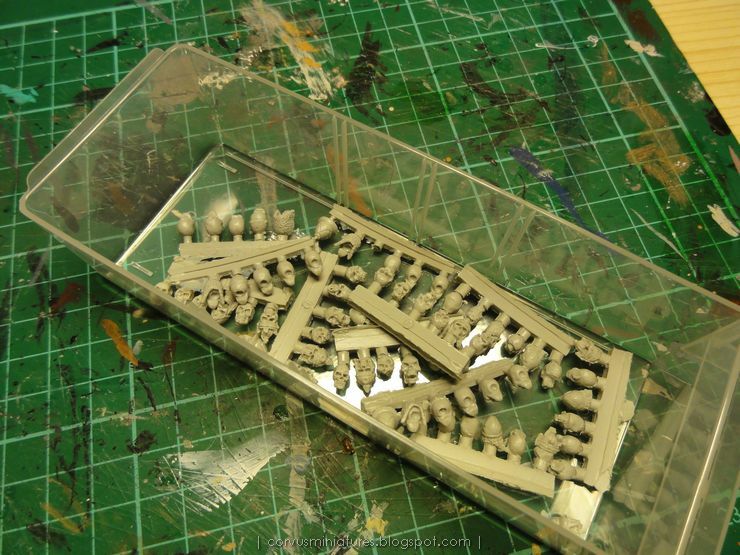 I thought these Fenryll resin skulls would fit nicely. 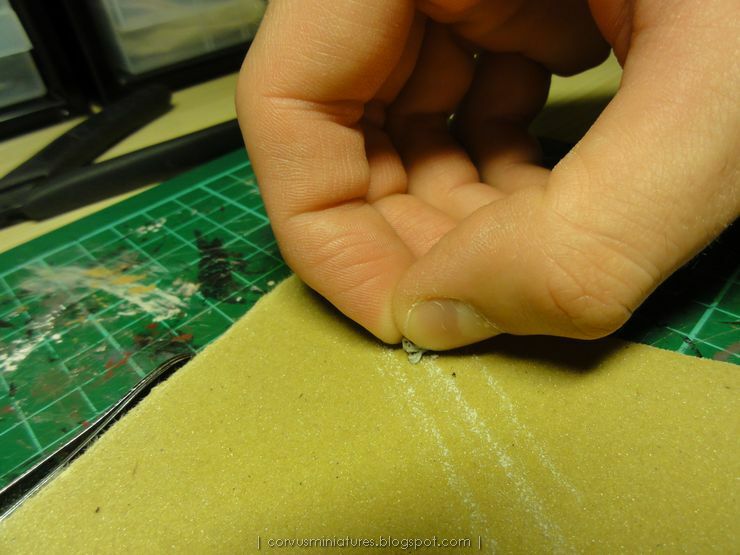 Here's a quick tip if you want to firmly attach a small detail on a base. Lay down a flat piece of sanding paper and move the object over it a few times, in the position you want to glue it down. This creates a flat surface on the bottom which allows more room for the glue. 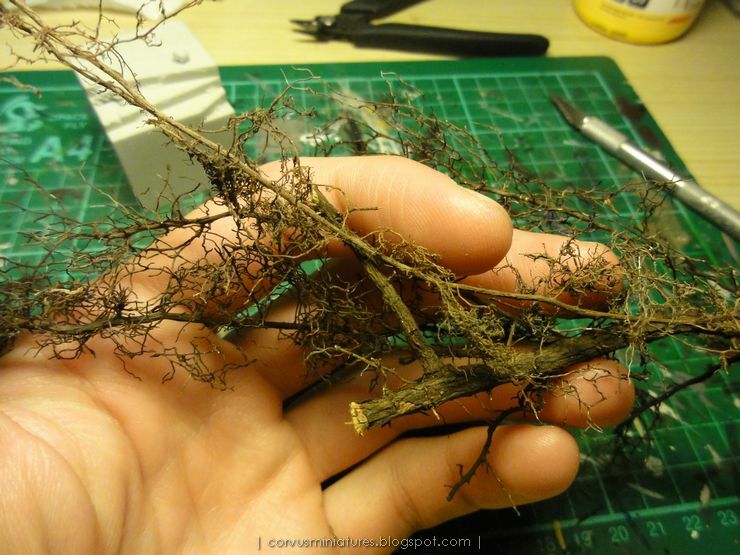 Next detail: some fine plant roots. 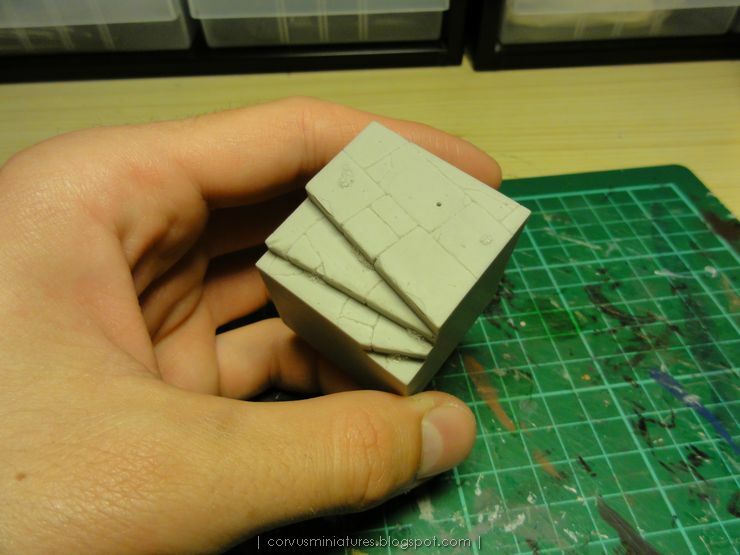 I cut off some small pieces and fit them on the base, cutting them more to fit on the base. Then I drenched them in diluted wood glue and put them into place with the help of some small drops of superglue. 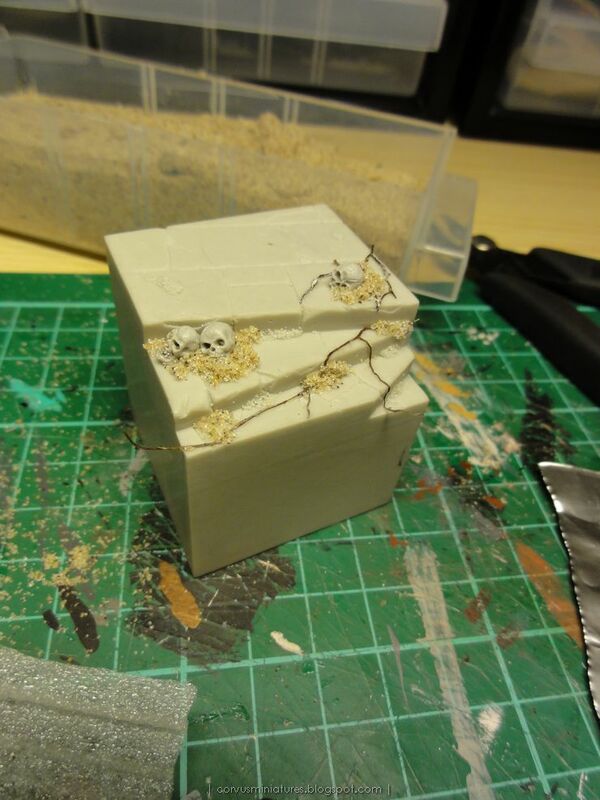 At the same time I glued some sand in place, around the plant roots and the skulls. I primed the base black. I must admit this was done a bit too sparsely, but my spray can of back primer was almost empty :) The fact that not all crevices are well covered isn't really a problem. When painting showcase models it's better to have too little primer on than too much. 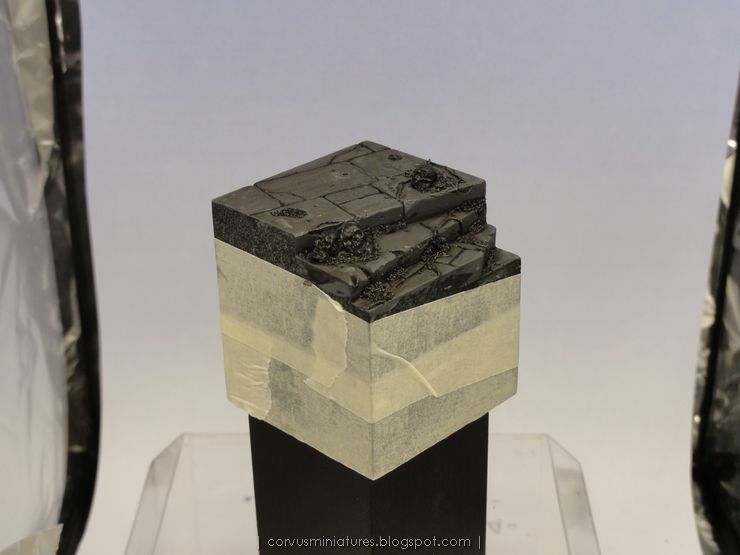 All the stone areas were basecoated using two layers of Vallejo Model Color (VMC) Basalt Grey, thinned to a 3:1 ratio (3 parts paint, one part water) and applied with a #3 brush. After that I created a 3:1:4 mix of Vallejo Acrylic Wash (VAW) Black, VAW Sepia and water. This mix was liberally painted onto the entire base. I did this two times. When that was dry I painted one some pure VAW Black, with a touch of VAW Sepia, in the recesses between the stones, around the sand, etc. At this point I returned with the basecoat color, but created a much thinner mix, about 1:1 VMC Basalt Grey and water. 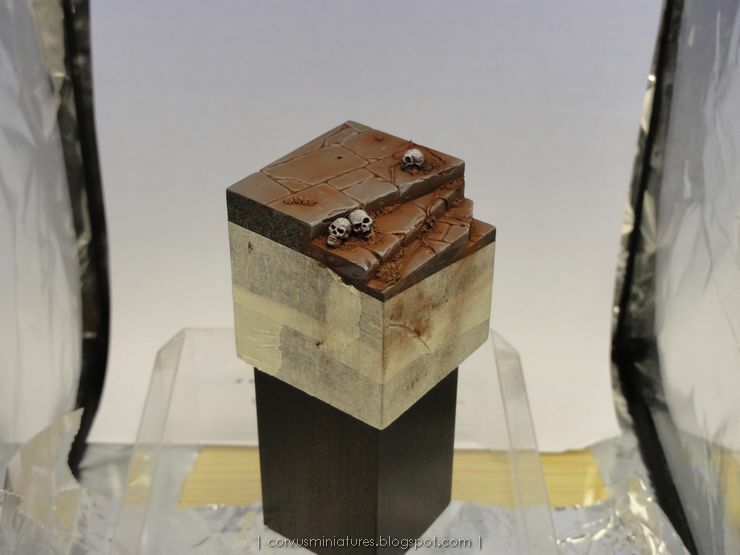 I painted most of the stones with this color, careful not to have it run into the in between. I'm still using a #3 brush here, not really paying attention to the smoothness of the paint. This way the stone recieves a hint of texture. I highlighted the edges by adding white to the mix, I did this in three stages. 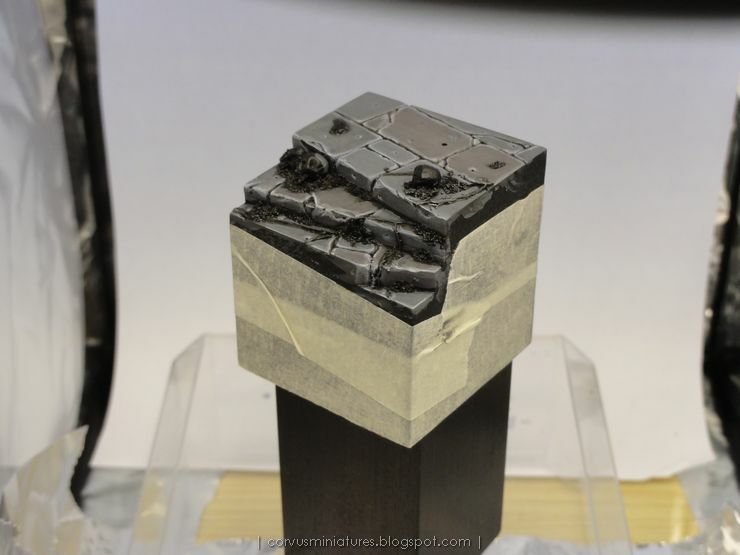 For the few stones which were not painted in VMC Basalt Grey, I created the same basecoat mix, but added points of VMC Mahogany Sand and VMC German Black Brown. These colors are used on the figure's armor as well, so it will really tie well to the base. It's painted on and highlighted the same way as the other tiles. Next up are the sand areas. These are basecoated with a mix of black with a point of VMC Mahogany Sand. In a few steps, by adding more Mahogany Sand VMC Deck Tan, the sand was highlighted, in a drybrush fashion of painting. The last highlight was pure Deck Tan. The result looks a bit harsh, but the last step of painting the base will be to cover the entire thing with pigments, and this will smooth out a lot of the rude highlights of the sand. For the roots I used similar colors: the basecoat was black with some VMC Germany Camo Black Brown. For the next layer I used pure VMC Germany Camo Black Brown, then started adding VMC Deck Tan. Now the work on the final detail can begin: the skulls. 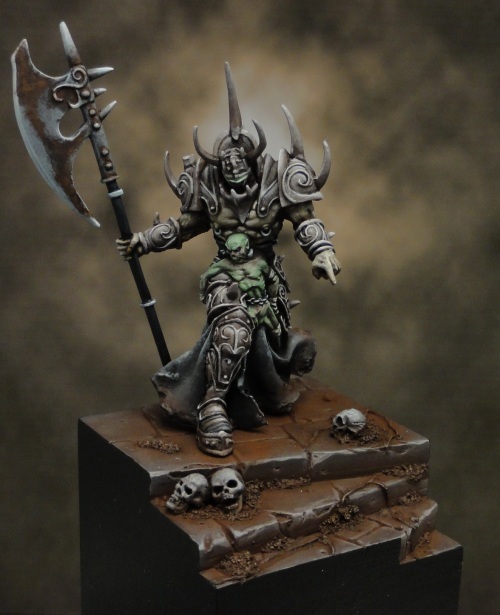 What I did first was to paint the skulls entirely with somem slightly dilluted black paint. The purpose of this is to make sure areas like the eye sockets and inside the mouth are shaded, the black primer also didn't reach there. The basecoat was done using VMC Basal Grey with a touch of VMC Deck Tan, making sure the paint didn't get in the areas mentioned previously. Shading was done by adding a bit of VMC Germany Camo Black Brown and black. Highlight was done with white. As a final step I dry-painted on some pigments. I always use Vallejo Earth & Oxide pigments. 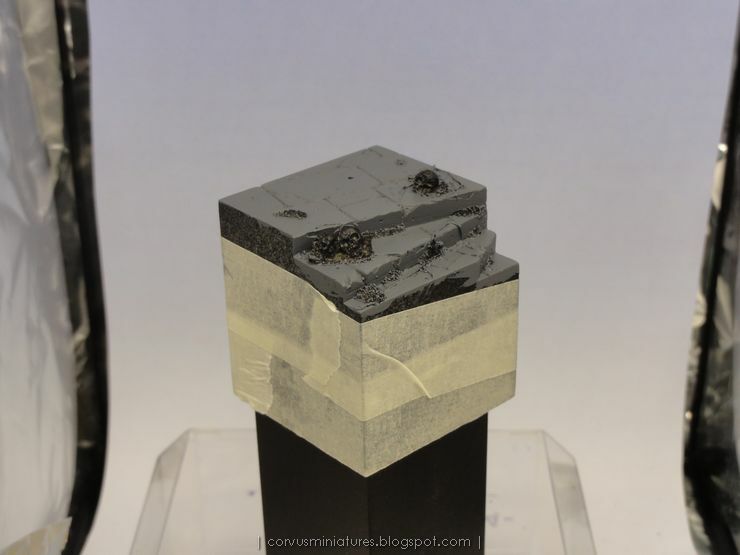 I mixed up some Carbon Black and Brown Iron Oxide. Just to keep things clear: I'm not adding any water, just the dry product! Then I started to apply the mix around the sandy areas, and in the corners of the stairs. Careful not to get too much of the stuff on the skulls. All that's left now is to carefully remove the masking tape from the sides and paint them black. 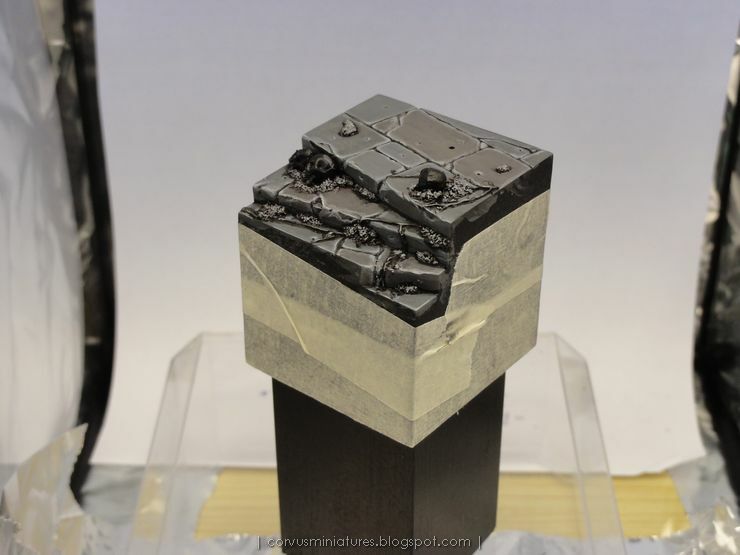 I always add one or two layers of varnish to the sides of the base, to avoid the black paint to rub off when handling the miniature. And then comes the spectacular moment of bringing the miniature and the base together! That's it for this tutorial, I hope it was useful. Please consider leaving feedback if you thought this was helpful. If you want to stay up to date please subscribe to my blog, easiest way to do this is to click one of the square (social) media icons in the top right. Thank you! sure it was helpfull man! Thanks Gerrie for a great tutorial. I love how you gave this base your own touch by adding simple, yet very effective elements. Great mini overall! In terms of future tutorials, white and black have always been a huge PIA for me. Any help there would be fantastic. Ths base work here is great. Thanks for the showcase.